Graphic artist, book designer, painter. Great-grandson of Decembrist Vasily Ivashev and his wife Camille Le Dantue. Graduated from the Vyborg School of Commerce in Petrograd (1917), simultaneously studied under Mstislav Dobuzhinsky, Alexander Yakovlev and Osip Braz at the New Art Workshop (art school founded by Princess Gagarina). In autumn 1918 entered the Painting Department of the State Free Art Studios in Petrograd, Kuzma Petrov-Vodkin’s workshop; from March 1921 studied at Dmitry Kardovsky’s workshop, simultaneously studied under Vasily Savinsky and Grigory Bobrovsky. In 1923 changed the faculty to the polygraphic one, studied under Pavel Shillingovsky, Elizaveta Kruglikova, Vladimir Konashevich and Dmitry Mitrokhin; graduated as a book illustrator (1925). 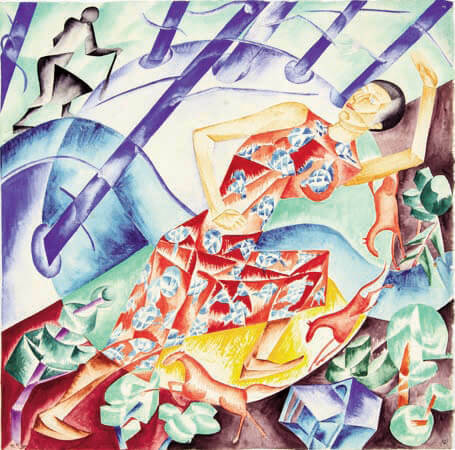 Contributed to exhibitions (from 1918), including the exhibition of modern painting and drawing of Nadezhda Dobychina’s Artistic Bureau (1918); exhibition of paintings by Russian artists in Pskov (1920), World of Art (19220, exhibition of Russian art in New York (1924), International Exhibition in Paris (1937, gold medal for illustrations to Hamlet), etc. Worked as a draughtsman in the Petrograd Commune (1917–1919), a designer in the theatre of the Baltic Fleet (1920– 1921); taught at the School of Drawing of the 2nd City District and evening classes of the Baron Stieglitz Higher College of Decorative and Applied Art (1918–1920); collaborated with various publishing houses: Raduga (Rainbow), Mysl (Thought), Vremya (Time), Priboi (Surf), Obrazovanie (Education). In April 1925 moved to Paris together with his wife Anna, daughter of Alexander Benois, and their son. Painted landscapes, practiced xylography, illustrated books. On 22 June 1941 together with his son was arrested by occupation authorities and imprisoned in the Compiègne concentration camp (because the family lived in France with Soviet passports) but freed in a few months. On 31 July 1943 committed suicide after the opening of his solo exhibition in Paris.